This guide walks you through the ins and outs of gift cards for small businesses—everything from what to consider when choosing a closed-loop gift card vendor to best practices for marketing your cards. You’ll come away ready to knock your gift card sales out of the park. If you’re just thinking about gift cards as a “nice to have,” think again. A successful gift card program reaps a ton of benefits for your small business and plays a huge part in helping you grow. 1. Why does every small business need gift cards? Gift cards help you expand your customer base. They’re also a great marketing tool. 2. How do you choose a gift card program? If you’re just starting out, choose a gift card program that’s easy to implement, integrates with your POS, and has a simple fee structure. 3. How do you make gift cards for your small business? You can customize Square’s gift cards by uploading your own graphics. You can also work with our vendor to design your cards. 4. How do you sell business gift cards? The easiest way to sell business gift cards is to go with a solution that you can track and redeem through your POS. 5. How do you maximize your gift card program? To make your gift card program successful, you should implement a marketing campaign that includes email, social media, and prominent placement in your store. Get started with Square Gift Cards. Pay no monthly subscription or redemption fees for gift cards. There are two different types of gift card services for businesses: closed-loop gift card programs and open-loop gift card programs. With a closed-loop gift card, buyers can only redeem their gift card at the store where it was purchased. An open-loop gift card gives people the option to use their gift card at a variety of businesses. A gift card that’s exclusively for a place like Sephora, for example, is a closed-loop gift card. One that’s redeemable wherever a certain credit card processor is accepted, on the other hand, is an open-loop gift card. Open-loop gift card programs are typically offered by banking institutions. Understand the different gift card program options in order to decide which is best for your business. 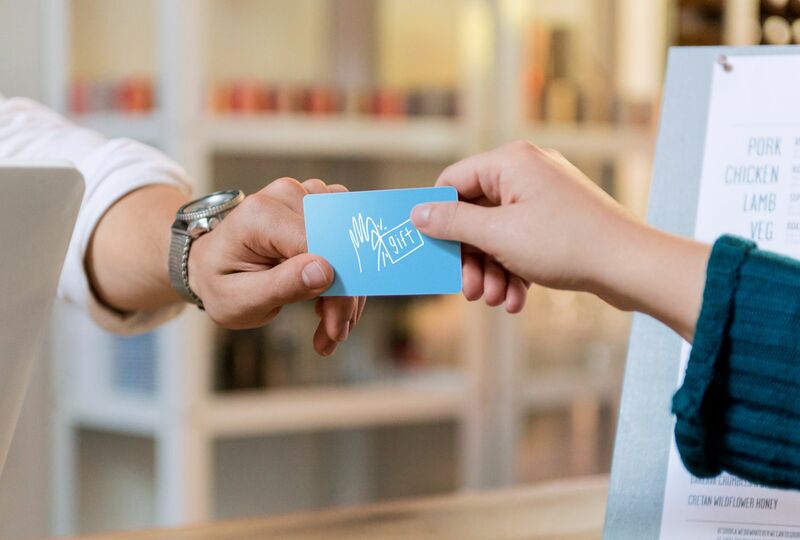 If you’re a small business, a closed-loop gift card program may be the best place to start. That’s because it’s typically the easiest to implement and track, and also tends to have less complicated terms than open-loop gift card programs. Closed-loop cards are also usually easier to customize—that is, create your own pricing structure and design the actual card with your own branding. Having a closed-loop gift card program, however, does not exclude you from participating in an open-loop gift card program. It’s possible to have your own branded gift card program and also sign on to be part of a collective gift card program. Perhaps it’s because they’re convenient. Or perhaps it’s because they’re a great gift alternative when you’re stuck on what to get someone. But people buy gift cards in droves. Every year, the data supports this. According to the National Retail Federation’s (NRF) 2015 Holiday Survey, 58.8% of consumers said they would like to get a gift card this holiday season, making this the ninth year in a row that gift cards have topped the list of most requested gift items. For the 2015 holiday season, gift card spending was expected to reach $25.9 billion. Consumer demand for gift cards has grown significantly, and is expected to continue to grow in the next several years. What’s more, people love getting gift cards. In the National Retail Federation’s October 2015 survey on Gift Receiving and Returning, nearly 60% of people indicated that they’d like to receive a gift card this year, making it the most requested item for almost ten years in a row. So if you don’t offer gift cards, it’s time to get in the game, if only to give the people what they want. Say you’re a discount shopper who rarely splurges on clothes. But if you get a $50 gift certificate to a store and see a full-priced item you love for $60, you’re more likely to act out of character and get it. Likely due to the psychology of having “free” money to spend, people who shop with gift cards tend to splurge on full-priced items rather than comb through the sale racks. That means you move more of your full-priced inventory than the stuff you’re trying to phase out. Gift cards can help increase your average ticket size and introduce new customers to your business. There’s also the matter of unused gift cards. Fact is, even though people say gift cards top their list, a lot end up forgotten and unredeemed (likely stuffed in the back of wallets). In fact, a report by CEB TowerGroup estimated that $750 million on gift cards went unredeemed in 2014. While unused gift cards aren’t exactly the thing you want to root for at your business (not exactly in the spirit of giving), there’s no denying that they pump up your bottom line. You can also offer incentives that reward both the gift giver and the recipient to encourage them to return. One way to do this is with promotional offers. “Buy a $200 gift card, get $20 for yourself,” for example. You could also prompt the gift recipient to come in to redeem the gift card at a certain time (a holiday weekend, for example) to receive a discount on the total purchase. When people are in the market for gift cards, they often turn to the big-box stores—likely because they see it as the easiest option. But if their favorite neighborhood shop offers gift cards, they may be more likely to head there, as the gift could be perceived as a bit more personal. (“I love this bakery, they have the absolute best chocolate chip cookies in the city. Tell them I sent you, they know me!”) Offering gift cards (and, of course, advertising that you have them—more on that below), helps you compete for business with even the biggest retailers. Many businesses see a huge spike in holiday sales, followed by a lull in the subsequent months. But offering gift cards can help you buck that trend. Incentivize people who received gift cards to come in after the major holidays with post-holiday sales and promotions. That way, you can extend your holiday sales spike for as long as possible. Leverage gift cards to minimize the impact of seasonal slowdowns. As a small business, there are a number of ways you can get on the gift card train. 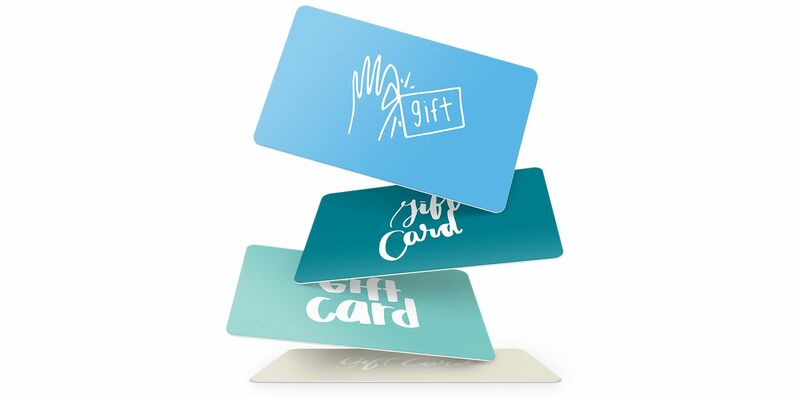 You can offer physical gift cards or gift certificates at your storefront and e-gift cards, which can be sent and redeemed online (usually from your website). Before you go out and buy a stack of gift cards, it’s a good idea to review your options, specifically paying attention to any fees that might be associated (aka make sure to read the fine print). See what gift cards can do for your business. Boost your sales and let customers gift your business to friends, family, and colleagues. Square’s gift cards are an example of a closed-loop gift card program (shoppers can only redeem them at your business). If you use Square to process payments, our gift cards integrate seamlessly into your register and Square Dashboard. The nice thing about that is that everything is centralized, which makes it easier to sell, redeem, track, and reload gift cards all within the same ecosystem. Gift cards also show up in all your reporting, so you can take an in-depth look at how many you’ve sold, as well as any outstanding balances. Square’s gift cards also have a simple pricing structure. While many gift card programs come with monthly and redemption fees, Square’s cards are a flat rate of just $1 to $2 per card, depending on your order. And if you just want to test the waters, you can start small. Square Gift Card Starter Packs are sold in sets of 20 (and ship the next day). You can choose from one of our templates (we have templates specifically tailored toward holidays) or design your own gift cards. Check out some examples of how small businesses have customized their Square gift cards for some inspiration. When it comes to gift cards, starting early is the name of the game. Well before any of the major holidays (the big December ones, in addition to Mother’s Day, Father’s Day, and graduation season), you should start getting your gift card program ready. With any gift card provider you go with, make sure you clearly understand how long the cards take to arrive, so you can make sure you have enough in stock when demand is high. Square’s gift cards ship quickly. That’s especially true when it comes to our Gift Card Starter Packs, which ship in one business day. Gift cards you create from Square templates ship in three to five business days, and custom gift cards (where you use your own design) ship in 15 business days. So if you’d like to offer custom gift cards for specific holidays, start your design early (which may involve hiring a professional if you don’t have that skillset in-house) so you can make sure they arrive in time to maximize sales. Just slapping a stack of gift cards on your counter gets a C for effort. If you want to sell a lot of gift cards, you need to make sure they’re as gift-ready as possible. A customized design goes a long way, as does offering free envelopes to go along with it. It’s also a nice touch to package gift cards within a small bag, where you throw in another small freebie. If you’re a chocolate shop, for example, maybe toss in a few treats along with the gift card. These types of things make the gift seem more special—and more personal. When people are shopping in your store, make sure you have your gift cards displayed prominently. That means on shelves between the racks, on top of any middle-of-the-store displays, and especially at your countertop (to encourage all those impulse buys). Make sure they look nice, though. Check out Pinterest to get ideas for creative ways to display gift cards. When someone returns something, you might consider offering a gift card in exchange, instead of cash. (Make sure to note this in your return policy.) That way, the money stays in your store. Offering gift cards for returns has the added benefit of preventing theft. If shoplifters know they can’t get cash for returning items they steal, they’re less likely to target your store. Especially around major holidays, do some marketing to let people know you have gift cards on hand. Social media is a great place to shout out the arrival of your new cards. When they arrive, post a picture of your gift cards to your Facebook, Instagram, and Twitter accounts. In these posts, be sure to include a link to where people can buy the gift cards on your website. It’s also a good idea to plan social campaigns targeted toward last-minute shoppers, who are on the hunt for easy gifts at the eleventh hour before the holidays. If you have the budget, you might also consider doing some paid social ad campaigns for your gift cards. Here are some tips for how to advertise yourself on social media. Leverage your strongest marketing channels to promote the sale of gift cards during key retail season. Email marketing is also essential here—especially to your regulars. The customers who know and love you are the ones who are most likely to give their friends an experience at your business. 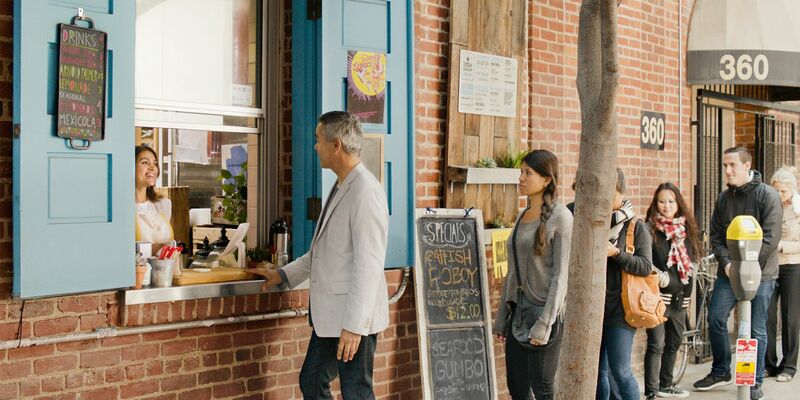 Luckily, targeting those people is a cinch to do with Square Customer Engagement. All your customers are already loaded into the system (since the tool syncs with the Square app) and segmented into three groups: loyal, casual, or lapsed. So you can quickly send an email to your loyal customers about your gift card program. Square Customer Engagement also has a ready-to-go email template for announcements, which would be a good one to put to use here. When you send out your email, consider offering people a free, low-value gift card if they come in with a certain promo code. Read more tips on how to sell a lot of gift cards. Another strategy is to distribute physical gift cards. 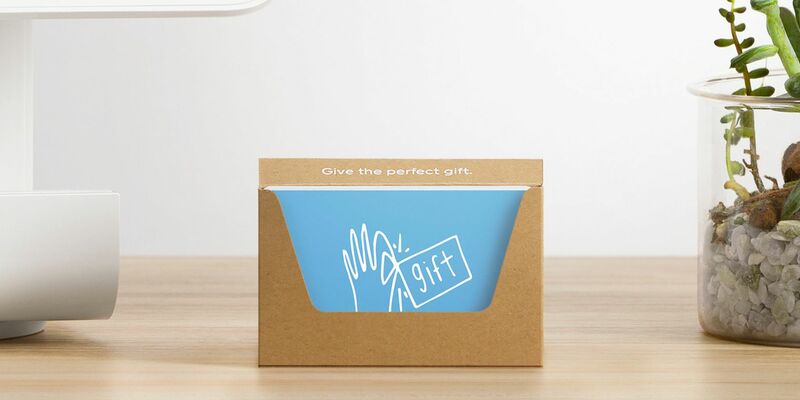 If you’re planning a mass mailing, consider including a gift card in the envelope (again, a low value here is probably smart) to entice people to come in. You might also give gift cards to other local businesses to use as holidays or promotional gifts.